It is often the case that when dancers attempt to attach their competition numbers to their costumes, they unintentionally damage their costumes by pinning their numbers incorrectly. This tutorial by Nick Kosovich demonstrates the correct way to apply your competition number to your dancewear. When attaching your number to your costume it is a common error to safety pin your number to the fabric of your dancewear by feeding it through the corner holes. There are two major problems with this. Firstly, by relying on the holes to secure your number to your costume, this allows for the paper to be loose and move around freely. Secondly, competition organizers are now laminating the numbers so they will not rip off when you are performing. This poses the greatest threat to your dancewear because when your number is pulled, the laminated paper is stronger than the fabric on your costume; causing it to snag. This guide is about to teach you a more efficient way of securing your number without damaging your dancewear! Step 1: Take your competition number in hand and bend it in half without folding it, so that the printed side of your number is facing the inside. Step 2: Firmly pinch both the top and bottom sides of your competition number. There should only be a slight crease to the edges to your competition number. Make sure the paper is not folded all the way through. This may/will effect your presentation. Step 3: Line up your competition number with the center seam of your dancewear/costume so that the paper with your number is perfectly aligned parallel to the floor. 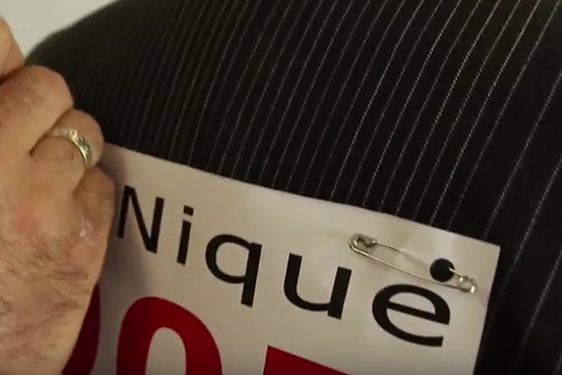 Step 4: Once you have your number in place, puncture/pierce your dancewear through a corner hole on your competition number with one of your safety pins; one safety pin per hole. Step 5: Now take your safety pin and feed it back THROUGH the paper so that it fastens securely to your dancewear. We hope you enjoyed this week’s tutorial on How to Pin Your Dance Number with Nick Kosovich. Tune in next week for even more insights into house of LeNique! Nick Kosovich is the former United States and World American Ballroom Champion. After competing for 36 years he retired from competition dancing in 2005. Nick is an Emmy Nominated Choreographer for Dancing with the Stars He also was a professional dancer on Season 2 and Season 3 of Dancing with the Stars. He is from Perth, Australia and the Co- Founder of LeNique. He currently resides in Los Angeles, Ca with his wife and co-founder Lena Kosovich. Did you miss anything from September? Checkout below for even more great tips from the House of LeNique! This is the final episode of Life with LeNique: Design a Dress. Follow us to Unique Dance-O-Rama in Irvine, CA Where we will meet Jude Coraldi and some of you who participated in Design a Dress! Welcome to another Episode of Life with LeNique: Design a Dress: Part 2! Today we will be going over the production process for Jude Coraldi's dress from the design table to the final touches. Welcome to another episode of Life with LeNique! Today we will be talking about the Design a Dress project. Many of you have tuned in and voted on two beautiful dresses! But, there can only be one winner. The winning dress for Design a Dress is design number 2! Our sponsored dancer who will be wearing the dress at the Unique Dance-A-Rama competition is Jude Coraldi! Jude Coraldi is a runner-up in the National and World Arthur Murray Championships, she has been a finalist in major national championships in American smooth, and she is not only an active competitor but she is also a manager at one of the top Arthur Murray studio in the United States. Today, Lena and Jude will be discussing the inspiration and creative choices for the winning dress! The dress will be displayed on Saturday, July 15th at the Unique Dance-A-Rama! Welcome back to another episode of LIFE With LENIQUE! Today’s episode is about How to press your dress with the amazing Lena Kosovich. Before a competition make sure to check your dress and make sure it is wrinkle free and dance ready. Welcome back to Life with LeNique!!! Today Lena we will be talking about extending the life of your dance shoes! LeNique Sponsored Dancers: "What's in My Dance Bag?" Welcome to another episode of life with LeNique! Today we have some of our sponsored dancers here to show you what they take to their competitions in their Dance Bag. Enjoy! Welcome to Life with LeNique! Today we are talking about how to wash your dress at home after the competition. This will be the first in a series of tutorials to show you how to wash dresses with different fabrics and different cuts. Today we will be washing a Latin dress with fringe. Welcome to Life with LeNique! Today we are continuing with Lena’s tutorial on how to get ready for your dance competition. Today’s episode is all about “What’s in My Dance Bag?” What do you need to bring to your competitions, dance shows, or studio performances so you are as prepared as possible? Welcome to another episode of Life with LeNique! In an earlier episode, we talked about the differences between a Regular jacket and a dance jacket. Today we are going to talk about men’s trousers. Welcome back to part 2 of What to Wear for Your First Competition. We will continue where we left off last week discussing dance costumes for men for Smooth and Standard.